Train travel in Spain . . .
Once upon a time, Spain had one of the most backward train networks in western Europe. Now, they have one of the best, indeed, one of my favourite rail systems. High-speed AVE trains (Alta Velocidad Española) link major cities at up to 186mph, and if you book in advance online you can find some great cheap fares at the official Spanish rail website, www.renfe.com. This page will give you a heads-up on how to travel cheaply around Spain by train. Spain by train, in a nutshell - the key points to know. What are Spanish trains like? How to buy train tickets for Spain - the cheap way! 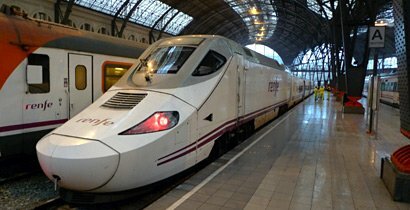 UK to Spain by train - Train times, fares, tickets. Renfe, see www.renfe.com for train times, fares & online booking in Spain, but see this advice on using it - you'll find www.loco2.com easier to use. Local trains around Bilbao, San Sebastian, French frontier: www.euskotren.eus. Local trains in northern Spain (ex-FEVE): www.renfe.com/viajeros/feve. Madrid metro: www.metromadrid.es. Barcelona-Montserrat railway: www.fgc.cat. Find hotels in Spain Hotel reviews see www.tripadvisor.com. The key things to know, in a nutshell..
Where do the trains go? The network links all the major towns & cities. For a train route map, try www.bueker.net or http://en.wikipedia.org/wiki/File:Red ferroviaria_espa_ola.png. Who runs the trains? The Spanish national train operator is Renfe (pronounced Ren-fay), originally Red Nacional de los Ferrocarriles Españoles but now a brand name in its own right. Its website is www.renfe.com. Renfe runs Spain's superb high-speed AVEs and other mainline trains, as well as local and suburban trains nationwide. Local operators FEVE, Euskotren, FGC: In addition to Renfe there are several regional train operators which it's useful to know about. FEVE runs a rambling local narrow-gauge network along the coast of Northern Spain through Santander & Gijon. FEVE has now been absorbed into Renfe, see www.renfe.com/viajeros/feve. Euskotren (www.euskotren.eus) runs narrow-gauge local trains from the French border at Hendaye & Irun to San Sebastian & Bilbao. And in Barcelona, you might want to use the FGC local railway to reach the famous monastery at Montserrat, www.fgc.cat. However, this page is mainly concerned with travel on Renfe mainline trains. Do you need a reservation? Should you pre-book? Yes! 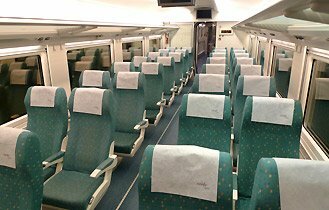 All long distance trains in Spain and even some shorter distance regional ones require a seat reservation, you cannot just turn up and hop on. There are usually places available even on the day of travel, but at peak times such as Christmas and Easter trains can get full. 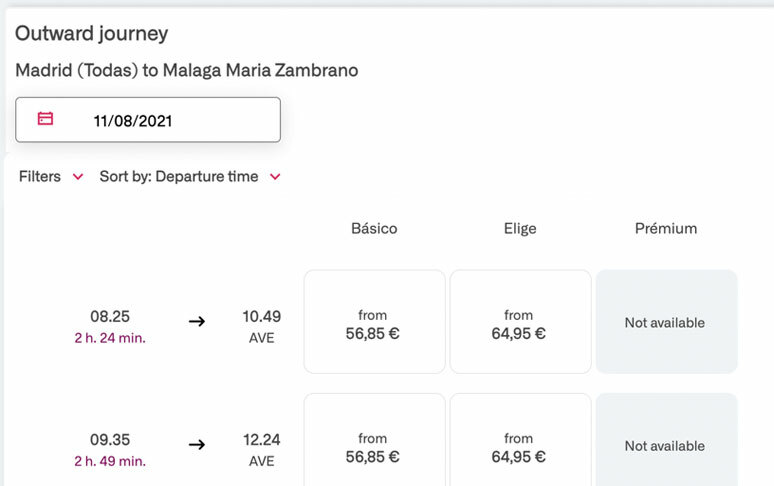 It also pays to pre-book: If you book in advance there are cheap Promo & Promo+ fares, for example Madrid-Seville from €28, but if you wait to buy your tickets on the day you'll pay the full-price Flexible fare, for example Madrid-Seville €75. When do reservations open? In theory, bookings should open 60 days ahead for all trains other than AVE trains which should open 90 days ahead. However, this isn't exact - Renfe loads dates in large blocks as and when it feels like it, often significantly less than 60 days and often loading some trains before others. If you go online and don't see the complete train service which you're expecting to see, and it's more than a month to go before departure, the chances are that all trains are not yet loaded. Renfe is particularly lax in opening bookings for dates after the timetable changes at midnight on the 2nd Saturday in June and 2nd Saturday in December when the booking horizon can shrink to as little as 30 days. Classes: Turista, Turista Plus, Preferente... Renfe offers two classes, Turista (2nd class) and Preferente (1st class), but on the best high-speed AVE trains it also offers Turista Plus (premium 2nd class), which means Preferente-type 1st class seats but without the Preferente weekday at-seat meal service or access to the Sala Club lounges. More explanation about classes on Spanish trains. Promo, Promo+, Flexible... Flexible (shown with an F when booking at renfe.com) is the full-price refundable & changeable fare, you can buy a ticket at this price on the day of travel if you like, assuming seats are available. Promo (shown as P, no changes, no refunds) and Promo+ (shown as P+, limited changes & refunds) are cheap advance-purchase fares, the price & availability vary like air fares, so book early for the cheapest prices. 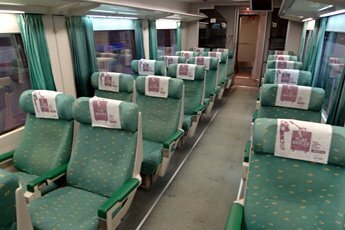 Flexible fares allow you to choose an exact seat from a seating plan if you book at renfe.com, and if your buy a Preferente class flexible ticket you can use the Sala Club first class lounges at major stations. There's no option to select your seats with a Promo or Promo+ fare. You can use the Sala Club with a Preferente class Promo+ ticket, but not with a Preferente class Promo ticket. Mesa fares... Mesa fares, shown with an M when booking on Renfe.com, are cheap advance-purchase fares for small groups of 3 or 4 people. Mesa means table, and if you select a Mesa fare you will pay four times the price shown whether there are two or three or four of you, and get exclusive use of four seats facing each other around a table. If you book a Mesa fare when there's less than 4 of you, you'll still need to fill in 4 names and passport numbers on the booking system, by re-using your own names and passport numbers more than once. Round trip discount... For a return journey you'll see a fare with a double-arrow symbol against it, this is simply the Flexible fare with a 20% round-trip discount. There is no discount for round trips made with Promo, Promo+ or Mesa fares, which are often cheaper. Children & infants: Children under 14 pay the child fare. Infants under 4 travel free as long as they don't occupy a seat, but since 2014 it's been mandatory to get a free infant ticket before you travel - this is a first for any European train operator! You will get the necessary free infant ticket If you book all your tickets at www.loco2.com or renfe.com as you can simply add your child to your booking entering their age. You cannot book an infant ticket alone without any adults, so if you forget to add them to your original booking, no worries, you'll just need to get a free infant ticket at the station ticket office before you board. Seniors over 60: In most cases the best advice for a visitor to Spain making one or two pre-planned train trips is to forget being senior, just go online in advance and buy a cheap advance-purchase Promo fare, which is up to 60% cheaper than the Flexible price whatever your age. However, if you are over 60 you can buy a Tarjeta Dorada card for around €6 which gives a 25%-40% discount on Renfe's Flexible full-price fare - no discount on Promo or Promo+ fares. You can only buy a Tarjeta Dorada card at Renfe stations or agencies when you get to Spain, and you can only buy reduced-fare tickets at stations or online at Renfe.com when you have the card number. You'll find full details if you go to www.renfe.com and look for the Tarjeta Dorada page. How to buy tickets & check train times: You can buy tickets at any Renfe station or online at www.renfe.com following the advice on using Renfe.com below. Wherever you live, this is the cheapest and best option. However, if you have any problem with Renfe.com, you can now buy Spanish train tickets very easily in plain English at similar prices at www.loco2.com (in €, £ or $, no fee) or www.raileurope-world.com (various currencies, small fee added) or www.petrabax.com (in US$, small mark-up), with no payment problems and still with Renfe's own print-at-home tickets. X-ray baggage checks. In this photo you can see the pair of X-ray machines at the entrance to platforms 1-6 at Barcelona Sants. It's not like an airport - only your bags are checked, not you! It usually takes a few minutes. Sala Club first class lounges... This is the lounge in Madrid Atocha. 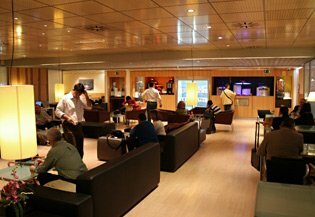 There are also lounges at several other major stations including Barcelona Sants, Seville Santa Justa, Madrid Chamartin, Cordoba, Alicante. For anyone with a 1st class ticket other than the very cheapest Promo fares (Promo+ & Mesa tickets are allowed!). Free suburban tickets with any long-distance ticket (Combinado Cercanias): When you buy an AVE or other long-distance Spanish train ticket of any type or class for a journey within Spain, you can get free travel from any Renfe suburban station at the start of your journey and free travel to any Renfe suburban station at the end of your journey, in the following cities: Asturias, Barcelona, Bilbao, Cadiz, Madrid, Malaga, Murcia/Alicante, San Sebastian, Santander, Seville, Valencia and Zaragoza. You also get free travel from/to any FEVE local station in Asturias, Santander, Bilbao and Cartagena. To use these suburban (Cercanias) trains you must get a free suburban train ticket from a self-service ticket machine or staffed ticket office using the CombinadoCercanias password printed on your Renfe long-distance ticket, underneath the main ticket number & localizador. At your starting city, you must use the suburban ticket within 3 hours of your long-distance train departure, and at your destination you must use the suburban ticket within 4 hours of your long-distance train's arrival. Full details are at renfe.com/viajeros/tarifas/CombinadoCercanias (in Spanish, use Google Chrome browser to translate). 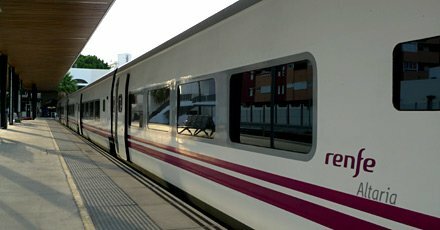 The CombinadoCercanias offer applies to any Spanish domestic long-distance tickets bought directly from Renfe.com or from websites which directly connect to Renfe such as loco2.com, petrabax.com & raileurope-world.com. As far as I know it does not apply to international tickets such as Paris-Barcelona, nor to tickets bought from non-Renfe websites such as oui.sncf or raileurope.com, as these won't print any CombinadoCercanias password on the ticket, but feedback would be appreciated. Luggage & luggage weight limits on Spanish trains: You take your bags with you onto the train, putting them on the racks above your head and at the end of each car. Renfe is unusual in specifying a 25Kg weight limit for passengers' baggage, which is a nonsense, first because a weight limit is totally unnecessary on a train as it does not have to take off, and second because your bags will not be weighed at any stage, so as long as you don't take the Mickey, this weight limit is pretty much irrelevant and can be taken with a big pinch of salt. It's probably the result of employing an ex-airline senior manager! For information about left luggage at Spanish stations, see the luggage on trains page. X-ray baggage check at Spanish stations: Before boarding any high-speed train at any Spanish mainline station, you must pass through an X-ray baggage check. This usually only takes a few minutes, a bit longer at busy times, but don't turn up for your train with only 30 seconds to spare! Sometimes this is at the entrance to the departures area, as at Madrid Atocha, sometimes at the entrance to a platform or group of platforms, as at Barcelona Sants or Algeciras. There are usually no metal detectors, so you can carry what you like on your person, it's usually only the baggage that's checked. Make sure any (perfectly legal) penknives, corkscrews etc are in your pockets not your baggage so don't get scanned, to avoid a jobsworth refusing to allow them on, as happened to one passenger. Food & drink: On most long-distance trains there's a cafe-bar serving tea, coffee, drinks and snacks. Of course, you're also free to take your own food and even wine or beer onto the train. First class lounges at stations: All Preferente class ticketholders including Promo+ but excluding Promo give you access to the Sala Club (1st class lounges) at Madrid Atocha, Madrid Chamartin, Barcelona Sants, Cordoba, Seville, Malaga, Alicante, Zaragoza and several other major stations, opening hours and full list on the Renfe website. You can see what these classes are like in the section below. WiFi: Renfe's front-rank AVE trains are now being fitted with WiFi. 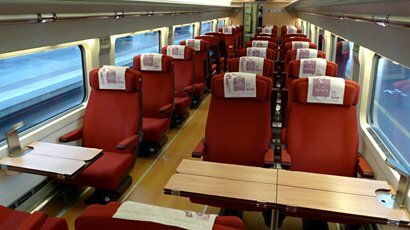 You should now find WiFi on AVE trains between Madrid & Seville, Madrid & Malaga. Madrid to Barcelona AVEs should be fitted by April 2019. The WiFi is free in preferente class, in turista class it costs a free euros (free to those who have signed up to Renfe's free +Renfe loyalty scheme). Bikes: See the bikes by train page. Taking dogs & pets: See the dogs & pets section on the Europe by train page. If you just want to go from A to B cheaply, forget railpasses, just book a cheap Promo or Promo+ ticket online in advance. It won't get any cheaper than a Promo or Promo+ fare! But if you want to buy your train travel in bulk, and retain flexibility without having to commit to a specific train way in advance to get a cheap fare, it's worth considering a railpass, especially Renfe's own Spain Pass. 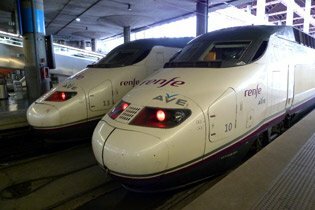 Renfe's Spain Pass: In addition to InterRail & Eurail passes, Renfe now offer its own Spain Pass to anyone resident outside Spain, which can be better value as it includes all reservations, no hidden costs. Renfe's Spain Pass works differently from Eurail & InterRail Spain passes, it gives between 4 and 12 individual one-way train journeys of any length (depending on the number of journeys you want to pay for) in a one-month period, it does not give not unlimited travel. One journey = 1 train ride, if you change trains, that's 2 trains. 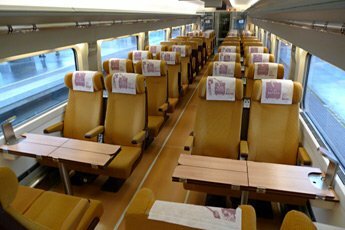 The Renfe Spain Pass includes all reservations, there are no hidden fees, and no quotas - if there are empty seats on the train, you're entitled to get one with your Spain Pass. With Renfe's Spain Pass it's all included, reservations are free and can be made online. You can buy a Spain pass online at www.renfe.com/EN/viajeros/viajes internacionales/spainpass (cheapest, direct from Renfe, but has a few quirky translations and sometimes struggles with some credit cards) or at www.acprail.com or www.internationalrail.com (these two will be a few euros more expensive, but in plain English with no card payment problems). The pass is emailed to you. 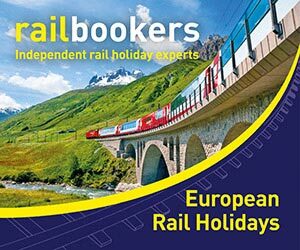 If you live in the UK, you can buy a Spain Pass and make any associated reservations you want by calling www.internationalrail.com on 0844 248 248 3, there's just a small booking fee. How to make reservations with a Spain Pass: You can make reservations to go with a Spain pass either at stations as you go or in advance online at www.renfe.com. 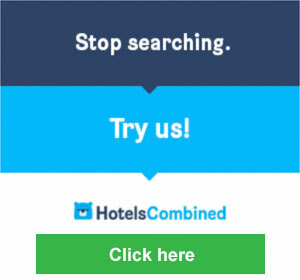 Click Welcome at the top for English. Now scroll down and look for the grey block marked Spain Pass - it's level with the I'm Irene bit. Click the Spain Pass block then click Purchase on the left. Then look for and click Journey validation in the green menu on the right - this is where people get stuck, as it isn't obvious that journey validation' means 'make a reservation, but it does! Enter your pass details. When these are accepted, you can book trains easily - though don't make a Preferente seat reservation of you only have a Turista class pass! You may also find these instructions helpful: www.acprail.com/blog/wp-content/uploads/2014/01/Pass-_Manual_Renfe.pdf. Spanish long-distance trains generally have two classes. Turista = 2nd class, and Preferente = 1st class. 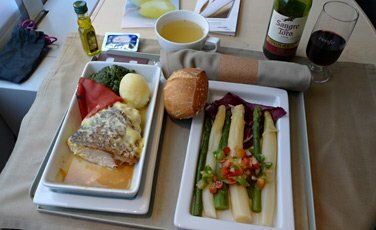 On weekdays on AVE & EuroMed high-speed trains, Preferente usually includes a hot airline-style meal & wine, see the info above. Turista Plus: On the most important front-rank AVE high-speed trains and some other front-rank services you'll also find an intermediate class, Turista Plus. This gets you Preferente-style first class seating with more elbow & leg room and fewer seats per car, usually arranged 2+1 across the car width instead of 2+2, but it comes without any complimentary food or drink and without access to the Sala Club lounge at stations. The Turista Plus concept started on AVEs & EuroMed trains but has now been rolled out to other long-distance trains too, nicer roomier seating but no added services and no access to lounges. It can help to know a bit of recent history about Renfe's changing class structure on its best AVE high-speed trains: Before 2013 AVE trains all had Turista, Preferente and Club, where Club was premium 1st class superior to Preferente. AVEs were built with three different types of seating for these 3 classes and a meal & wine was included in both Preferente & Club 7 days a week, the meal in Club being higher quality. In 2013 Renfe cut catering costs on less busy AVE trains by replacing Turista, Preferente & Club with Turista, Turista Plus & Preferente, where Turista Plus got you the nicer Preferente-style seating but without any meal or wine and a Preferente ticket got you a meal & wine on weekdays only and usually got you a seat in the original Club class car, but at busy times you might end up in one of the original Preferente cars as there's only one Club class car and that isn't always enough. So at this point Renfe had four classes although no more than three on any one train! Then in 2015 Club class was completely discontinued leaving Turista, Turista Plus & Preferente as the standard three classes on all AVE & EuroMed departures with Preferente class including access to the Sala Club (except for the cheapest Promo tickets) and including food & wine on weekdays, a Turista Plus ticket getting you a seat in one or more of the original Preferente cars and a Preferente ticket usually but not always getting you a seat in the original Club class car. Do try and keep up! Turista is perfectly comfortable and it's the way most people travel. But if you want the extra space and legroom of a 1st class seat, you'll get this with either a Turista Plus or Preferente ticket. 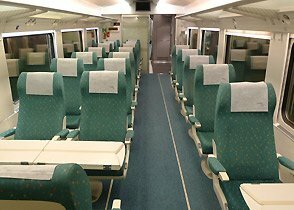 First class seats used for Turista Plus and Preferente ticket holders are usually arranged 2+1 across the car widths, so will include some tables-for-2 and individual solo seats as well as tables-for-4 and unidirectional 2-abreast seats. Turista seats are arranged 2+2 across the car width, so only feature tables for 4 and unidirectional 2-abreast seats. See train seat numbering plans. AVE or Alta Velocidad Española is Spain's front-rank high-speed train. Reservation is compulsory, and all trains have a cafe-bar. AVEs are now being fitted with WiFi, free to all travellers in preferente class or those in turista who have signed up to Renfe's free +Renfe loyalty scheme. Internet access costs a few euros for other passengers. A hot meal with wine is usually included in Preferente on weekdays, see the information above. AVE trains come in various types. S100: The original French-designed AVE used between Madrid & Seville, see the photos below. S102 & S112: The Spanish Talgo-designed AVE used between Madrid & Malaga, Barcelona & Malaga/Seville, a classy train indeed, see S102/S112 photos here. S103: The German-designed AVE used between Barcelona & Madrid plus some Madrid-Malaga trains, see S103 photos here. All aboard! This is an S100 AVE from Madrid to Seville. 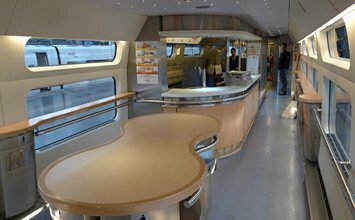 All AVE trains have a cafe-bar serving drinks and snacks, or you feel free to bring your own food, wine or beer on board. Cafe-bar. All AVEs and most Altaria & Alvia trains have a cafe-bar serving snacks, hot & cold dishes, tea, coffee, beer & wine... This is an S100 cafe-bar. 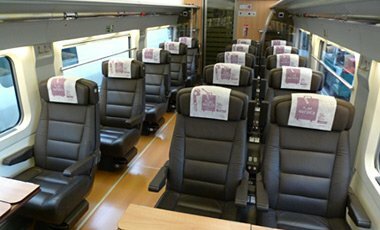 AVE Preferente (1st class) with reclining leather seats, power sockets for laptops & mobiles. A hot at-seat meal with wine is included in Preferente on Monday-Fridays, see info above. AVE Turista Plus (premium 2nd class) with reclining seats, power sockets for laptops & mobiles. AVE Turista (2nd class) with comfortable seats, power sockets for laptops & mobiles. These S130 trains operate the EuroMed services linking Barcelona with Valencia & Alicante, as well as Alvia trains from Madrid to Cadiz & Huelva. They consist of little articulated coaches built by the Talgo company sandwiched between two duck-billed power cars. There are other Alvia services operates by similar trains with a diesel power-car added, and a few Alvia trains (including Barcelona to Bilbao, Pamplona & San Sebastian) operated by the wedge-nosed S120 type, of similar high quality. All Alvia trains have a cafe-bar. On EuroMed services a hot meal with wine is usually included in Preferente on weekdays, see the information above. An Alvia train at Barcelona Franca. It's a type S130 nick-named patito or little duck, for obvious reasons! 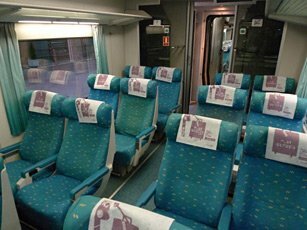 Preferente (1st class) seats on a EuroMed train. An S130 EuroMed train at Barcelona Franca. These run on many long distance routes, including Madrid-Ronda-Algeciras and Madrid-Granada. Little articulated trains built by the Talgo company and hauled by a separate locomotive, they have adjustable axles so they can run at up to 125mph on the high-speed AVE lines (which are standard European gauge) then go though a gauge-changing shed to emerge on traditional Spanish broad gauge to complete their journey on the classic network. All Altaria trains have a cafe-bar. An articulated Talgo Altaria train at Madrid Atocha. Preferente (1st class) on an Altaria train. 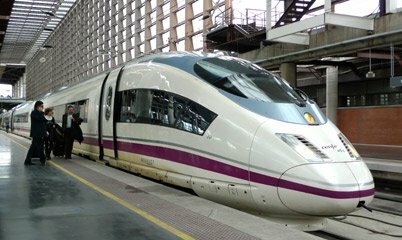 The quickest & easiest way to buy Spanish train tickets is at www.loco2.com with cheap advance-purchase fares & print-at-home or collect-at-station tickets. You can choose to pay in €, £ or $. 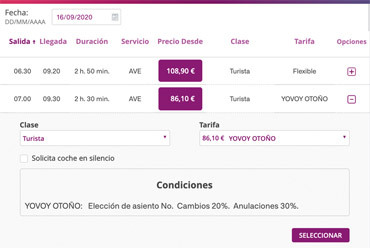 Loco2 links directly to Renfe's (Spanish Railways) ticketing system and charges the same price in euros as Renfe themselves with the same print-at-home tickets and no added booking fees. Unlike Renfe's own site it's in plain English without any of Renfe.com's quirky translations and credit card rejection problems. Anyone from any country can use Loco2 as international credit cards are accepted. It can also sell international trains between Spain and Portugal or France, as it also links to the French, German, Italian & British ticketing systems. Who are Loco2? If you have a baby or infant, remember to add them as a child and enter their age, they'll still go free but will get the free infant ticket which is now necessary in Spain. www.trainline.eu also connects to Renfe's ticketing system to sell Renfe tickets at exactly the same prices as Renfe themselves with the same print-at-home or collect-at-station tickets, very easily, all overseas credit cards accepted. However, they now impose small booking fee of around €3.45. You should also avoid departures marked ALSA as these are long-distance buses and not trains. Spanish trains are marked Renfe. If you'd rather pay in USD, use www.petrabax.com. This is a US-based agency which also links directly to the Renfe ticketing system to sell the same trains as Renfe.com with the same print-at-home tickets. They add a small mark-up, but it's easy to use in plain English and it avoids the English translation and credit card acceptance problems people can experience with Renfe.com. Anyone from any country can use Petrabax, including the United States, Canada, Australia, India & Singapore. You can of course buy tickets direct from Spanish Railways at www.renfe.com, in € with print-at-home tickets. Unfortunately, Renfe.com has more than its fair share of quirks and a reputation for rejecting a significant proportion of overseas credit cards. It's very fiddly to use. Pretty much the only reason to battle with renfe.com rather than buying easily from www.loco2.com or www.trainline.eu is that it may allow you to select a specific seats from a seating plan, although only if buying an expensive Flexible fare, and only if you manage to spot the easily-missed link. However, www.loco2.com or www.trainline.eu allow you to choose seating options and they both show you your seat numbers before you pay, so you can always compare them with a a seating plan then run multiple enquiries if you don't like the first ones you are given, adding seats to your basket until you get ones you like. Then cancel the ones you don't need and pay for those you do. 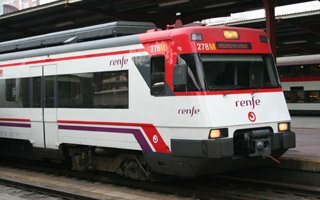 If you want to try using Renfe.com please read the advice on using Renfe.com below. It frustrates many people, though I have to say it has always worked fine with my own credit card and it now also accepts PayPal. Renfe.com also doesn't handle connections well, so if you want to book (say) from Bilbao to Seville you'll have to guess that this involves a change in Madrid, then book as two journeys, Bilbao to Madrid and Madrid to Seville - whereas Loco2 can generally book from anywhere to anywhere as one transaction, even if connections are involved. The advantage of using renfe.com is that (a) it sells in euros which you may prefer if your own bank account is in euros, and (b) it allows you to pick a specific seat from a numbered seat plan graphic with all fares Promo+ and above (i.e. not if you buy the very cheapest Promo fares). Loco2 allocates your seat, but allows you to see the proposed seat number before you pay, so you can always re-book if you don't like it. 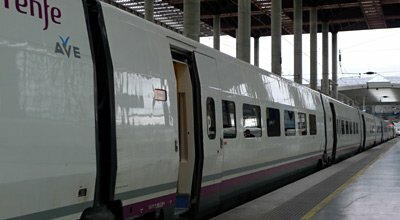 So if you want a quick and easy transaction, use www.loco2.com, but if you really want to choose an exact seat and are prepared to overcome the odd few words of Spanish, try using Renfe.com with the help of the advice below. International Rail on 0844 248 248 3, lines open 09:00-17:00 Monday-Friday, £10 booking fee for orders under £100. Unfortunately, UK agency Spanish Rail (www.spanish-rail.co.uk) closed in December 2016. Spanish train bookings usually open 60 days ahead, although AVEs may open up to 90 days ahead. You can't book before reservations open! If you see Train blocked in the search results it means that date or train hasn't opened for booking. The opening of reservations can be delayed for dates after the twice-yearly timetable change in June and December, as they're always late loading the data. The 60/90 days isn't exact, indeed, I often find that Renfe loads trains as and when it feels like it, often less than 60 days and sometimes certain trains appear on the system before others. If you don't see the complete train service which you are expecting to see, and it's over a month to go before departure, the chances are that not all trains have been loaded yet. 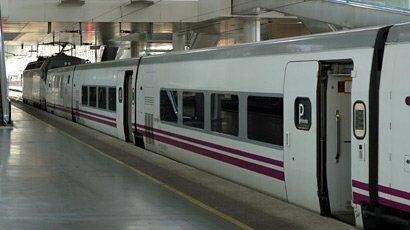 Before we start, here are two easier alternatives to Renfe.com: Buying direct from Renfe is the cheapest option, their site works fine for me and has always accepted my credit card. But I reckon that up to 25% of overseas travellers have their credit card rejected when using Renfe.com, especially Americans or Australians, so if you have any problems there are two easy alternatives, www.loco2.com (same prices as Renfe, no booking fee) and www.petrabax.com (prices in US$, with a small mark-up). Both agencies link directly to Renfe's ticketing system to sell the same trains with the same fares and the same print-at-home tickets. Renfe now also accepts PayPal. OK, so go to www.renfe.com and click Welcome at the top to switch it to English. If you're Australian and the renfe.com website is 'down' you are probably a customer of Telstra Bigpond. I've had a series of emails wondering why Renfe is 'down' since early 2014 and they're still coming. I originally thought the problem was Telstra's DNS settings, but it does now seem to be Renfe website that's set up incorrectly. Feedback appreciated. You can get around this problem by downloading & installing the excellent Hola! add-on for Google Chrome browser at https://chrome.google.com/webstore/detail/hola-better-internet/gkojfkhlekighikafcpjkiklfbnlmeio?hl=en then setting the browsing country to Spain. Or buy tickets at www.loco2.com instead. For Madrid, select MADRID (TODAS) as this means Madrid, all stations and the system will work out whether trains on your chosen route use Madrid Atocha or Madrid Chamartin. Similarly, for Barcelona select BARCELONA (TODAS) as this covers either Barcelona Sants or Barcelona Franca. For Seville, use Sevilla Santa Justa. For Malaga you want Malaga Maria Zambrano. For Lisbon use LISBOA (TODAS). The system cannot generally handle changes of train, it will only show direct trains plus a few popular connecting services that Renfe has manually programmed in. So if you ask it for San Sebastian to Algeciras it won't show any trains as there are no direct ones, but of course you'll see several trains if you ask it first for San Sebastian to Madrid, then separately for Madrid to Algeciras. The German railways journey planner at www.bahn.de can be useful in identifying journey options involving a change of train, which can then be booked at www.renfe.com in two stages. When you're done, click Buy... On the search results page you'll see a list of trains, each with the cheapest available price shown. At this point, it's worth taking time to register - because if you have any problems receiving your PDF format tickets later, you can log in to your account and see & reprint your bookings. To register, click REGISTER top right on the search results page. When registering, change NIF to Passport and enter your passport number where it says Document. Use only numbers and letters in the password you choose, no symbols. In the class column: Turista = 2nd class. Turista Plus = 2nd class service, but with a more comfortable Preferente-style seat. Preferente = 1st class. You can toggle between classes using the filter panel on the left or by clicking + under options and using the drop-down class box. If you're booking a sleeper, change the class to Cama turista (bed in a shared 4-bed sleeper), Cama preferente (sole occupancy of a 1 or 2 bed sleeper) or Cama Gran Clase (sole occupancy of a 1 or 2 bed deluxe sleeper with shower & toilet). If your class doesn't include the word Cama (Spanish for bed) it isn't a bed! M = Mesa fare for small groups and families of up to 4 people. Ignore this fare if there are only one or two of you. Mesa is Spanish for 'table'. The price shown is per seat for each of the four seats around a table, and with a Mesa fare you must always buy all 4 seats. So if the Mesa fare is shown as €30, you pay €120 and get all 4 seats. Which obviously only works out as €30 per person if there's 4 of you, it's €40 if there's 3 of you, €60 if there's 2 of you, or €120 if there's only 1 of you. The cost per person will appear in a box if you select a Mesa fare, to save you working it out. if you book a Mesa fare when there's less than 4 of you, you still need to fill in 4 names and passport numbers on the booking system, so need to use your own names and passport numbers more than once(!). P = Promo fare, no refunds, no changes to travel plans, no seat choice. This is the cheapest fare, you'll be allocated seats (but if there's 2 or more of you you'll still get seats together, so don't worry) but you aren't given the chance to select specific seats from a seating plan and in Preferente class you won't qualify for access to the Sala Club first class lounges at main stations. P+ = Promo+ fare, limited refunds, limited changes, no seat choice. The next cheapest fare, you used to be given the chance to select a specific seat but now you only get such a choice with Flexible fares. If you're booking a Preferente class Promo+ ticket you'll get access to the Sala Club first class lounges at main stations with complimentary snacks, tea, coffee and beer. Promo and Promo+ fares are available to anyone of any age, and are the best deal for Spanish rail travel. If booking at very short notice you may also see some cheap Ultima Hora (last minute) fares. Double-arrow = Return fare. If you're enquiring for a return trip, you'll see this option. It's simply a fully-flexible return fare (half of the return fare is shown for the outward and half for the return), this is the same as a Fully-Flexible fare but with the 20% round trip discount applied. It's usually cheaper to book a Promo or Promo+ fare each way. F = Flexible fare, also known as Tarifa General or General price = the full price. Seating choices & lounge access as for Promo+. Can't see any cheap Promo fares? The cheap Promo fares are sometimes not loaded for the whole 60 days ahead, so if none of these cheap fares appear on any of the trains on your date of travel, only expensive full price fares, it may be worth waiting a little longer and the promo fares may appear, assuming it isn't such a busy day for travel in Spain that they've decided not to offer any, of course. Fiddle with the filters and options boxes until you get the combination of train, class & fare you want, then click on the price. Sin determinacion, seleccion de asiento, pasilio or ventana? Pasilio & ventana simply mean 'aisle' or 'window' seat. Sin determinacion means without specifying. If you see seleccion de asiento pick this and you'll be allowed to choose your exact seat from a seat plan after the payment stage (recommended!). You only see this option if you have chosen a Promo+ or higher fare type, but not if you have chosen a cheap Promo fare as seat choice isn't allowed with a Promo fare. On the next page, enter your details. Change Document - DNI drop down box to Passporte and enter your passport number in the box. Enter your phone number with no spaces between the numbers and no preceding 0, for example 1844292884. Leave the +Renfe card section alone, unless you have a Renfe discount card, which you probably don't. Enter your payment details: Enter your card details and complete the purchase, or use PayPal if you want. Renfe uses the 3D Secure/Verified by Visa/MasterCard Secure system, you should enable your credit cards for this. Make sure your browser will allow pop-ups as you might otherwise lose your PDF format tickets, which pop up as a new tab or window. Error GU001 at payment stage? If you get error message GU001 when paying, it could be your bank blocking an unusual foreign transaction, rather than renfe.com itself. Try another credit card, and/or call your bank and tell them you're making a legitimate payment on a foreign website. Renfe uses the 'Verified by Visa' and 'MasterCard Secure' schemes, and anecdotal evidence suggests that a card that doesn't work before it is enrolled in one of these schemes suddenly works once you've signed up. Print your tickets: When you've booked and paid, the tickets should automatically pop up in PDF format in a new window or tab. You can print them out on your own PC printer, and save them to your PC. Personally, I not only print a spare set of tickets to place elsewhere in my luggage, I save the tickets to a dropbox.com account I can access from anywhere. These PDF format print-at-home tickets are valid for travel without further formality. You do not need to 'check in' or exchange them for anything. Just board the train and show the printout when asked! It has your reserved seat and coach numbers printed on it, along with your travel date, train time and journey. If your print-at-home tickets fail to appear, do not navigate away from the confirmation screen before noting down the localiser booking reference, which will also be shown in an email you'll be sent. If you have the localiser, you can type it into the ticket machines at the station to print your tickets, even if you haven't been able to print your tickets at home. If you get really stuck, try calling renfe for help on 00 34 902 10 94 20. The operators usually speak English and even if you didn't register they can usually provide you with your booking's ‘localiser' which then allows you to print your ticket at the station either at the staffed ticket office or self-service machines. Feedback (positive or negative) is very welcome if you use renfe.com to buy tickets, especially as things change from time to time and I won't always spot it. If you have any difficulty, for example credit card payment errors, buy from www.petrabax.com instead, see the alternative ways to buy Spanish tickets. Some trains use Madrid's modern Chamartin station in the north of the city. The trains to Seville, Granada, Malaga leave from Madrid Atocha station (also known as Puerta de Atocha) about 20 minutes walk south of the city centre. It's easy to transfer between stations by frequent suburban train. The Spanish for suburban train is 'Cercanias', look for the orange and white 'C' logo. 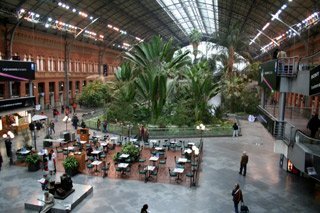 Madrid Atocha station: The old historic trainshed at Madrid Atocha has been turned into an attractive tropical garden, with café... High-speed trains to Barcelona, Malaga & Seville leave from a modern concourse, out of shot directly behind the photographer. 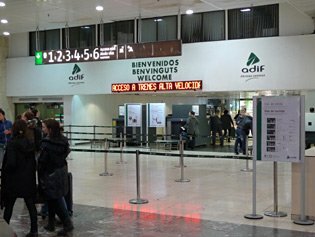 For train departures to Seville, Malaga, Barcelona & Algeciras, you must climb the stairways or escalators shown in the right and left of this photo to a first-floor departure area and X-ray check. Suburban trains to/from Chamartin station (plus a few mainline trains that start at Chamartin) use underground through platforms shown in the renfe.com timetables as 'Atocha Cercanias'. Panorama photo of Madrid Atocha old hall. You can buy a suburban ticket to Atocha from the self-service machines, which have an English language facility. The fare is only €1.70, the machines accept euro notes and coins. If you have an AVE or other long-distance train ticket, you may get a suburban ticket free, see the advice here. Go to platform 8. Trains from this platform all go to Atocha, leaving every 5-10 minutes. The journey is 3 stops and it takes just 10-15 minutes. Alternatively, the Madrid metro (www.metromadrid.es) links Chamartin station with Madrid city centre and Atocha station, though this takes longer. Or you can take a taxi. A taxi from Chamartin to Atocha will cost around €10. On arrival at Puerta de Atocha Cercanias platforms, follow the Salida (Way out) then Grandes Lineas (Main Line Trains) signs to the mainline concourse. For departures, take the escalators one floor up. Your luggage will be X-rayed before access to the departure area. When your train is ready for boarding you descend via a travelator to the platform to board your train. Note that a handful of mainline trains start at Chamartin and call at Atocha suburban platforms (Atocha Cercanias) rather than starting from Atocha's terminal platforms like other mainline trains. If you have a Preferente class ticket, including a Promo+ ticket but excluding a Promo ticket), you can use the Sala Club 1st class lounge at Madrid Atocha station just off the first floor departure area (turn right after going through the luggage X-ray check, walk along a bit, then the door it's on your right). In the Sala Club you'll find a quiet, civilised and relaxing lounge in which to wait, with complimentary tea, coffee, juices and free beer. It's open 06:00-22:00 Mondays-Saturday, 06:30-22:00 Sundays. Panorama photo of Madrid Atocha old hall. If you open this photo, turn around 180 degrees so you can see the escalators, the flow of people immediately above the black-and-orange departure display are filing through the baggage X-ray into the high-speed departures area. The trains are in a modern annex beyond that point. You can buy a suburban ticket to Chamartin from the self-service machines, which have an English language facility. The fare is only €1.70, the machines accept euro notes and coins. If you have an AVE or other long-distance train ticket, you may get a suburban ticket free, see the advice here. Go to platforms 1 & 2. Trains from these platforms all go to Chamartin, every 5-10 minutes. Alternatively, the Madrid metro (www.metromadrid.es) links Atocha station, Madrid city centre and Chamartin station, though this takes longer. Or you can take a taxi. A taxi from Atocha to Chamartin will cost around €10. If you have a Preferente or Gran Clase ticket (including Promo+ but excluding the cheapest Promo fares), you can use the Sala Club 1st class lounge at Madrid Chamartin station, through a poorly marked door next to platform 14. In the Sala Club you'll find a quiet, civilised and relaxing place to wait, with complimentary tea, coffee, juices and free beer. It's open 06:00-22:45 Mon-Fri, 06:10-22:45 Sat, 07:10-22:45 Sun. Paying for a guidebook may seem an unnecessary expense, but it's a tiny fraction of what you're spending on your whole trip. You will see so much more, and know so much more about what you're looking at, if you have a decent guidebook. For the independent traveller I'd recommend either the Lonely Planet or the Rough Guide, both provide an excellent level of practical detail and useful background. You won't regret buying either of these guides! Alternatively, download just the chapters or areas you need in .PDF format from the Lonely Planet Website, from around £2.99 or US$4.95 a chapter. For environmentally-aware guesthouses offering walking, hiking, riding or nature-watching in the Spanish countryside and national parks, try www.wildsideholidays.com, a new site listing independent, environmentally-aware properties across Spain. It was started by British ex-pats Clive Muir and Sue Eatock, when they found nowhere to advertise their own wonderful property deep in the heart of the Sierra de Grazelema near Ronda in Southern Spain. Clive and Sue can show you the local sights and wildlife, from wild orchids to ibex (wild mountain goats) to colonies of Griffon vultures. If you want to tour Spain by train, with all your train reservations and hotels sorted for you to your own specification, contact train tour specialists Railbookers and they'll create the best rail holiday for you, hassle-free. Unlike some overseas travel agents, they really do know all about train travel in Italy and right across Europe, and they know some excellent hotels, too. They take good care of their clients and it's not surprising they get a lot of repeat business, so I have no hesitation in recommending them. In particular, check out their Ultimate Barcelona, Madrid & Seville tour on their US & Canada site, or a top seller on their UK site, Madrid & Andalusia. Spanish city centres and cars don't mix well, so stick with the train for city-based tours. But if you want to get out of the cities and into the countryside, hiring a car can be a great idea. Start by trying Holiday Autos, www.holidayautos.com, they're part of Lastminute.com so are reliable and have a wide range of locations and very good prices.